HomeInformation Overload, What’s a Mother To Do? Information Overload, What’s a Mother To Do? Playwright Lisa Loomer’s Distracted at the City Lights Theater Company is many things: a commentary on the Attention Deficit Disorder epidemic pervading today’s society, a view into the social morays surrounding the malady, and an intelligent and whimsical play bringing into focus the myriad distractions of those dealing with a loved one so afflicted. Treating a serious subject with humor and artistic flair, this is a production worth seeing as it chronicles a mother’s quest to do right by her son. Be forewarned though, due to strong language and adult content, Distracted is not appropriate for young children. It’s not easy. Jesse is a handful, but depending on who Mama talks to, she gets different answers about what’s wrong with him and what she should do to help him. Regardless, her son is hurting, and dealing with him is causing a rift in her marriage, so she needs to do something. As she explores the options with her husband, Jesse’s teacher, some rather interesting neighbors, and a whole raft of therapists and doctors, she only gets more confused and concerned. Through her exploration, she stumbles upon the revelation that part of her husband’s resistance to getting Jesse treated is that he too suffers from many of the same symptoms, and he is in denial that Jesse’s behavior is outside the norm. She also becomes aware that many others outside of her family are dealing with some rather severe conditions of their own. Premiering in March 2007 in Los Angeles, and eventually moving to the Roundabout Theater in New York in 2009, Distracted has since become a favorite for theater companies willing to push the limits. 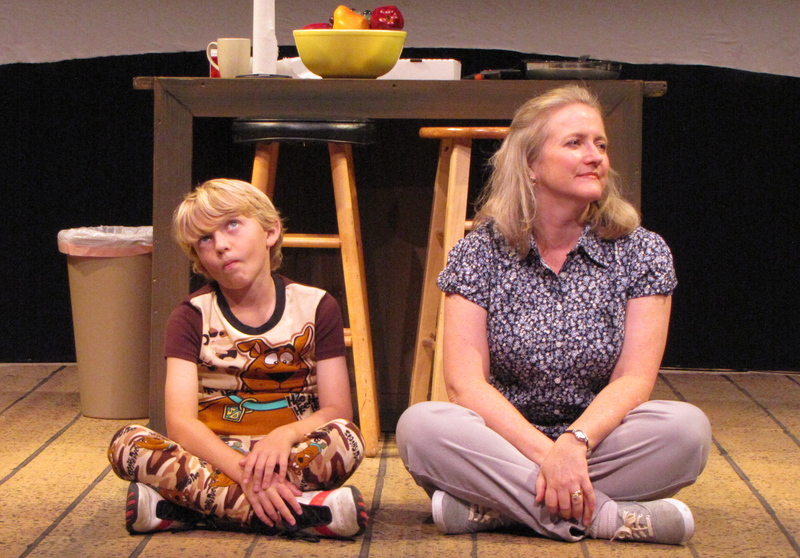 City Lights Executive Artistic Director, Lisa Mallette, directs this production and has assembled a strong ensemble cast centering around real-life mother and son, Karen and Kameron DeHart as Mama Cara and her son Jesse. 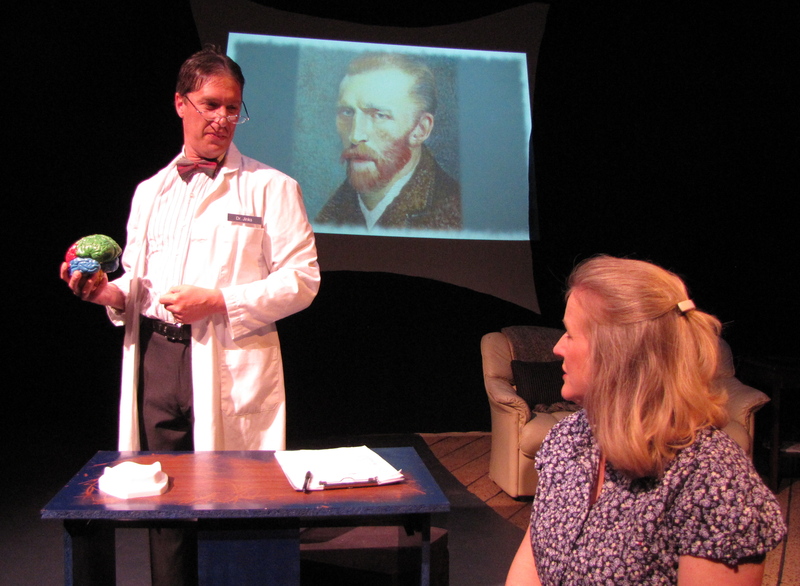 Others in the cast include: K. Michael Riley (Dad – Mr. Cara), Rachel Davidman (Mrs. Holly, Dr. Waller, and Nurse), Steve Gold (Drs. Broder, Jinks, and Karnes), Kate McGrath (Natalie), Jennifer Jane Parsons (Sherry), Mary Lou Torre (Vera), and Kristin Brownstone (Dr. Zavala, waitress, and Carolyn). Mallette overcomes some technical staging challenges with the help of her assistant director, George Psarras, nicely integrating the technology with the more human elements of the play. 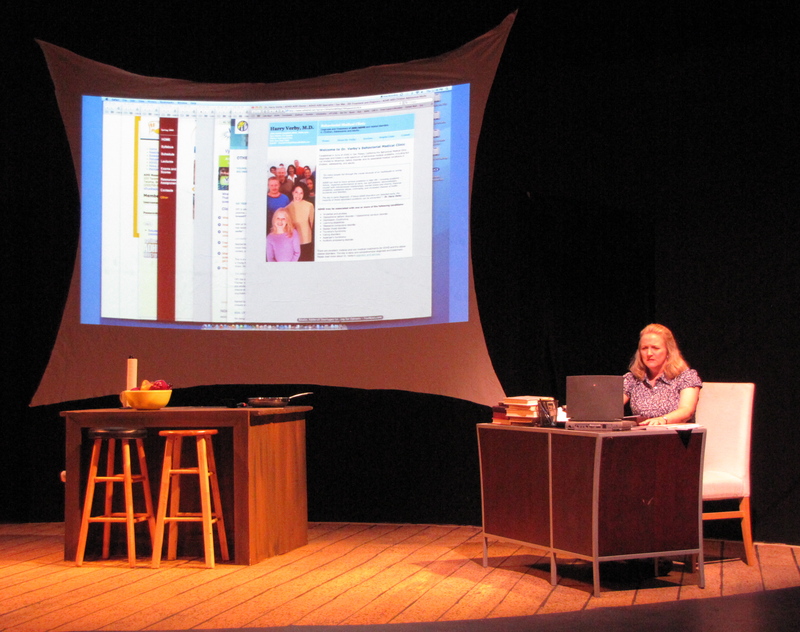 While not normally presented in this fashion, Mallette chooses to use three projection screens upstage instead of one. 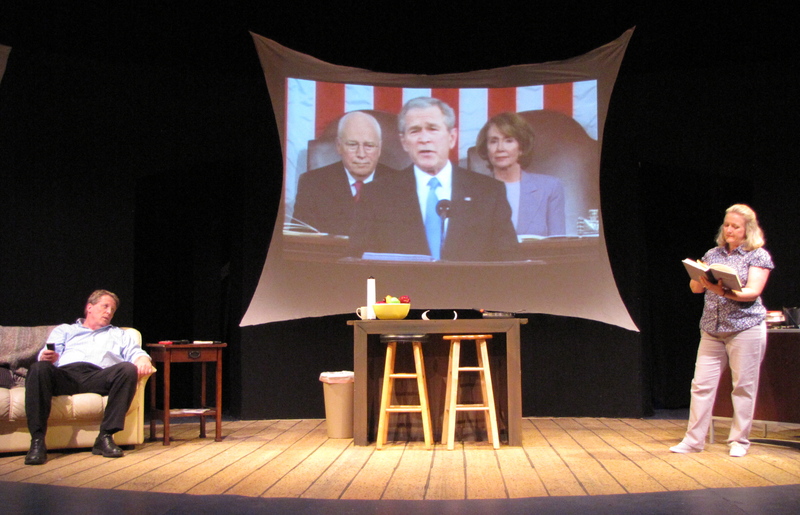 Serving multiple purposes, the ever changing pre-show news clips bouncing across the screens initially distract theater-goers from their conversations, and give them a taste of what it might be like to suffer from A.D.D. The screens are later used as backdrops at various times showing paintings, sporting events, and on occasion, the center screen serves as a computer monitor which shows the information overload we think of as normal suggesting that perhaps we are all somewhat afflicted by A.D.D. Ron Gasparinetti’s set consists of the three large screens mentioned above, a couch, a bar/kitchen, and a desk. When needed, chairs, footrests, pillows, and a rolling cart/desk are literally flung about by the cast, although this device is slightly overdone. As is often the case at City Lights, Psarras’ sound design also features some of his scene-appropriate original music, albeit a tad loud at times. While the play is about finding help for Jesse, Kameron DeHart spends most of his time offstage. We hear him throughout the course of the play as he argues loudly with his parents and announces scene numbers. When we eventually do see him, he interacts well with his mother and stage father though his movement is slightly wooden onstage. Karen DeHart handles her role as Mama with aplomb and serves as our guide through her struggle. She puts good energy into the role and is very entertaining during some of the more whimsical scenes as she talks directly to the audience. She tells us what she hears from others’ musings, even though that’s not always what the “real” characters are saying. She has good chemistry with both her son and Riley, and their interactions are believable. On opening weekend, she’s encumbered a bit by a nagging cough, even while onstage, but she doesn’t let it hamper her performance. Riley & DeHart – Defining A.D.D. Riley plays the most true-to-life character, rarely engaging in fantasy, but still providing some humor due to Dad’s physical and behavioral dysfunction – he keeps crashing into things and can’t focus. He’s also skeptical of all the treatments being suggested and voices this realistically. McGrath’s Natalie is an interesting character, who has a special relationship with Mama. As Natalie struggles with her own problems, she shares them with Mama who has no idea that she is so troubled, but Mama finds the exchanges both frightening and eye opening. McGrath straddles the line between exaggeration and realism convincingly in her portrayal. Torre’s Vera is initially very annoying, but her character gains favor through humor as we begin to understand her struggle with OCD. Gold, Davidman, and Brownstone are the “track” players, each slipping in and out of several roles, sometimes within the same sentence which is at times very funny, but can also cause the audience mild whiplash. Gold also breaks the fourth wall repeatedly as he seemingly steps completely out of character to offer “personal” commentary on the treatments being discussed. Both effective and amusing, this device adds another dimension to the piece. At times, the audience is used as a foil to make a point with very humorous results. Entertaining, informative, and engaging, this production is well done overall and is worth a look. Distracted continues Thursdays-Sundays through 19 June 2011 at the City Lights Theater Company located at: 529 South Second Street, San Jose, CA 95112. Contact the box office at: 408-295-4200 or see their website at: cltc.org to order tickets or to get more information.